Traditional jazz is the music made famous by Louis Armstrong, Jelly Roll Morton, and King Oliver in the 1920s. Our jazz club has been playing this style of jazz every Sunday afternoon for 27 years and we are always seeking new young bands and musicians to continue to play our type of music for many years to come. 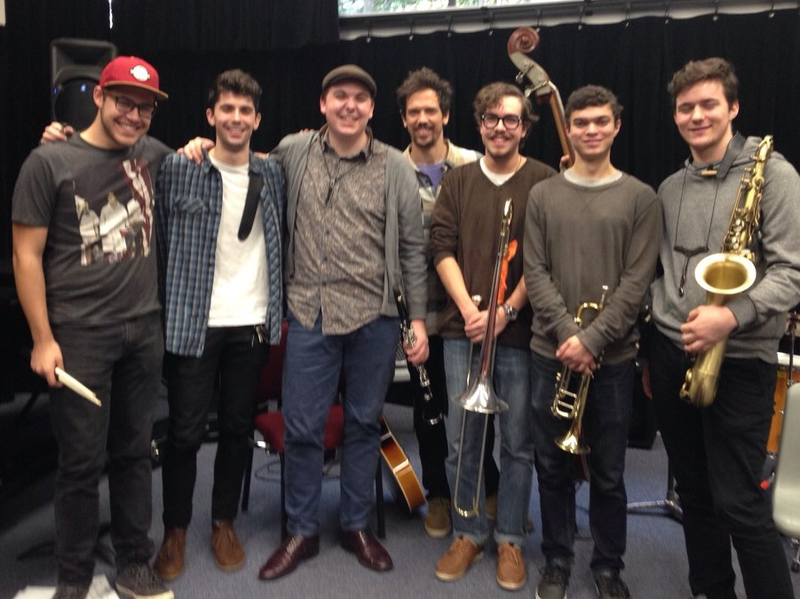 To further this goal the White Rock Traditional Jazz Society sponsored a "Youth Jazz" camp for schools from grade 8 through grade 12 for a period of four years. In 2017 we decided on a change in direction and targeted university/college students studying music for a bachelor's degree. Bands were invited to participate in the competition and two bands were selected - Lynn Stewart’s Teagardeners from Vancouver Community College and Ben MacRae’s Ridge Drive Ramblers from Capilano University. These two bands competed for the trophy at a one-day workshop held last October at Vancouver Community College. Both bands played a selection of well-known traditional jazz tunes and played them with enthusiasm and a high level of excellence. Judges were Dave Roper and Dave Ayton from our club and well-known traditional jazz clarinet/sax player Gerry Green. Selecting the winner was a difficult task but eventually the judges awarded the trophy to the Ridge Drive Ramblers. Trevor Whitridge on trumpet with Ben’s band won the best musician award. Special mention must go to Ben MacRae on clarinet, Coal Shultis on tenor sax, and, from the Teagardeners, Sebastian Chamney on guitar. Both these bands will be playing at our club in 2018 - check the calendar. In 2018, we hope to get more universities involved and expand the program. We thank everyone who was involved in putting on this event; it was a lot of work but worth the effort. Special thanks go to Vancouver Community College for their support in providing their facility free of charge plus the use of their equipment. Without them the event would not have taken place.